On my own or with my classmates, I made several student films (and slideshows) over the years, including book reports, as on The Hound of the Baskervilles and The Mysterious Island, and demonstrations of various (low-tech) special effects, as involving model-making, reverse motion, and pyrotechnics. Unfortunately, few of these have survived; although one humorous, live-action group production was used by our intermediate school as an orientation film for new students for many years after we graduated! Please see also my hand-drawn educational animated film in 16mm. 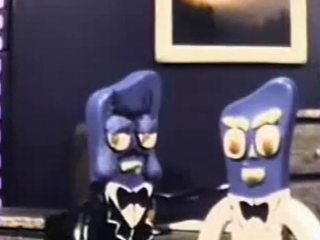 A two-minute “drama,” with apologies to Gumby and The Godfather (Voices by yours truly, too). 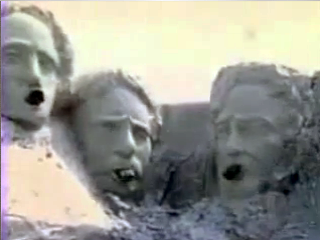 This surviving footage is the comic conclusion to a deceptively serious introduction of a “Bicentennial Salute” (Please be patient; the lighting in the film clip improves as the day of outdoor animation wore on).